A popular escape from the streets of Los Angeles, this island’s laid-back atmosphere and crystal-clear waters make it seem a world away from the busy city. Relax, snorkel and swim, or experience adventures such as diving in a mini submarine and zip-lining, all on Catalina Island, just 22 miles (35 kilometers) off the Coast of Los Angeles. Step off the ferry and onto the streets of Avalon, the main city, and head straight to the beach or stroll through the art galleries and souvenir shops. 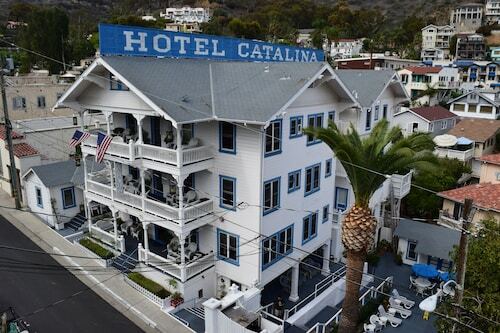 Catalina was developed in the late 19th century and features quaint old hotels and a gorgeous art deco casino. Dive or snorkel right off the pier or hop aboard a glass-bottom boat to gaze at local marine life. Organize a dive in a mini submarine to see octopuses, sharks and all kinds of fish, or for more action go parasailing or rent a Jet Ski. Catalina Island can get crowded in the high season, so to explore further afield rent a golf cart, available at a few places near the pier. If you’d like to go hiking and see some local wildlife, head inland for great views and the chance to spot island foxes, eagles or bison. Drop into the Nature Center at Avalon Canyon or the Santa Catalina Island Interpretive Center to learn more about the island’s wildlife and geography. Fly high above the forest canopy on the Cataline Zip Line, one of the island’s most exciting attractions, and enjoy sweeping views of the coastline. Back in Avalon, brush up on your local history at the Catalina Island Museum, check out the city’s video-game arcade, play mini golf, or tackle the rock climbing wall. For a great night out, head to the art deco Catalina Casino. Despite its name, this is not a gambling establishment. Instead, you’ll find an old-time theater and a ballroom that hosts plays, concerts and festivals. The Catalina Island Ferry leaves from the mainland at Long Beach, San Pedro and Dana Point. 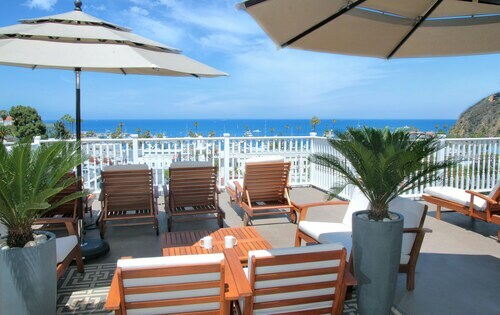 Situated near the beach, this hotel is steps from Catalina Island Chamber of Commerce and Visitors Bureau and Avalon Pier. Catalina Island Museum and Avalon Port are also within 5 minutes. 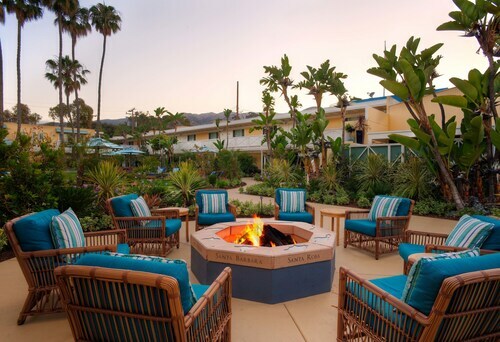 Situated by the ocean, this hotel is within a 5-minute walk of Catalina Island Museum and Catalina Island Chamber of Commerce and Visitors Bureau. Avalon Pier and Avalon Port are also within 15 minutes. 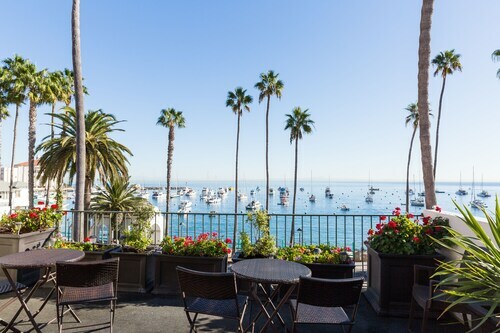 Situated in Avalon, this hotel is within a 10-minute walk of Catalina Island Museum, Catalina Island Chamber of Commerce and Visitors Bureau, and Avalon Pier. Catalina Casino and Descanso Beach are also within 15 minutes. 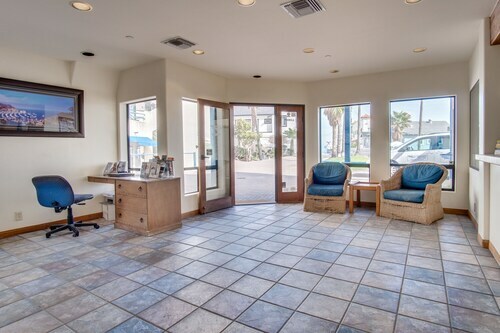 Situated near the beach, this hotel is within a 5-minute walk of Catalina Island Museum and Catalina Island Chamber of Commerce and Visitors Bureau. Avalon Pier and Catalina Casino are also within 10 minutes. 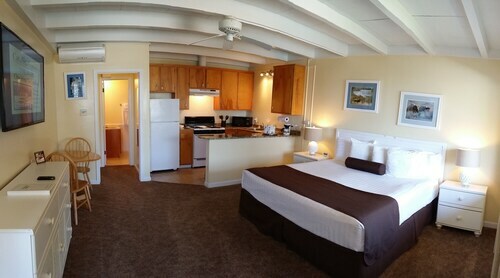 Situated in Avalon, this beach hotel is steps from Catalina Island Chamber of Commerce and Visitors Bureau, Avalon Pier, and Catalina Island Museum. Avalon Port and Catalina Casino are also within 10 minutes. 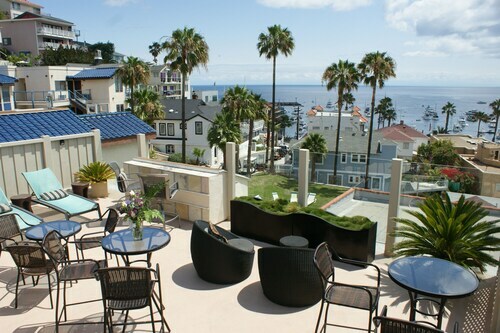 Situated in Avalon, this hotel is within a 10-minute walk of Catalina Island Museum, Catalina Island Chamber of Commerce and Visitors Bureau, and Avalon Pier. Catalina Casino and Descanso Beach are also within 10 minutes. Situated by the ocean, this hotel is within a 5-minute walk of Catalina Island Museum, Catalina Island Chamber of Commerce and Visitors Bureau, and Avalon Pier. Catalina Casino and Descanso Beach are also within 10 minutes.